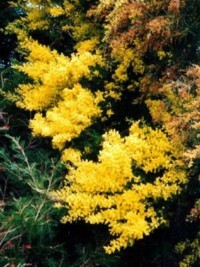 A fast growing and very showy wattle with fernlike, grey-green foliage and masses of golden yellow flowers in the middle of Winter. Frost resistant and grows to about 6m high. 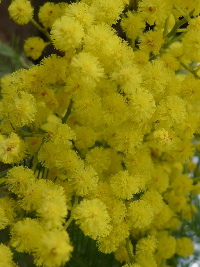 A fast growing and very showy wattle with fernlike, purple foliage and masses of golden yellow flowers in the middle of Winter. Frost resisant and grows to about 6m high. 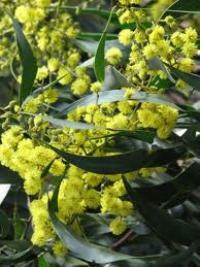 A medium sized, fast growing wattle with a green trunk, dark green, bipinnate leaves and very fine leaflets. 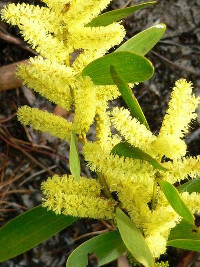 Bears masses of golden ball shaped flowers in Spring.Grows 12 to 15m high eventually. 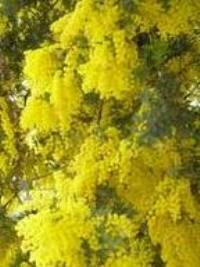 A beautiful, very fast growing wattle with dense foliage, an attractive weeping habit and masses of bright yellow flowers in Spring. Grows 4 to 6m high. Large, bushy shrub with masses of cream coloured flowers in early Spring. Being so dense and fast growing, it makes an excellent, quick screen. Grows up to 6m high. Large shrub with an attractive, weeping habit and unusual zig zag appearance along its branches. Used widely around Brisbane. Bears cream coloured flowers. Can grow up to 6m high. Good, dense screening plant with attractive weeping appearance. Leaves are narrower than A.fimbriata and it grows about half its height. Masses of ball shaped flowers appear late winter. Grows up to 4m high. 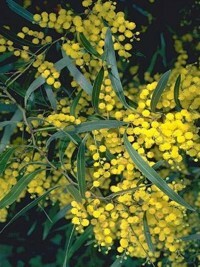 A quick growing, hardy, tall shrub /small tree with silver-grey foliage and golden ball - shaped flowers in late Winter.Grows up to 6m high. 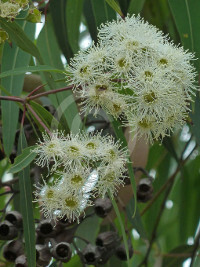 This beautiful little tree is Australias National Emblem. 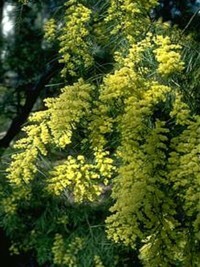 It flowers in late winter and spring, producing a mass of fragrant, fluffy, golden flowers. Dense, spreading shrub which is very useful screening plant for wind exposed (coastal or mountainous) areas. Bears masses of Golden flower spikes in Spring. 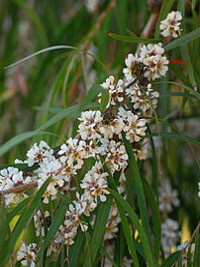 Grows up to 2 metres high and 3 metres wide. 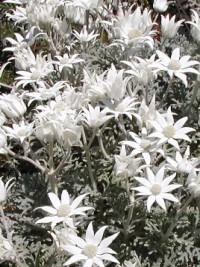 The Flannel Flower is one of the most recognisable Australian native flowers, with masses of attractive white flowers in Spring that have a flannel-like texture and grey-green foliage. 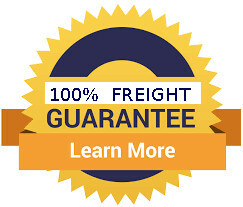 Lasts up to 4 years and is self seeding. To half a metre high. Lovely medium sized tree with a beautiful weeping habit. Bears masses of small white flowers in Spring. A good specimen and windbreak tree. Frost resistant. A beautiful specimen tree with striking new salmon/pink coloured bark which gradually turns grey, and its mass of white flowers which bloom over the summer months and are produced in large bunches. The individual flowers are about 2 cm wide with five tooth-like sepals, five larger semi-circular petals, and a large number of long stamens. The seed capsules are goblet-shaped, 2 cm long and as wide, often with fairly prominent ribs. 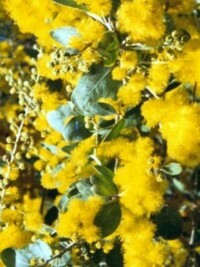 The usual recorded flowering time is December or January. A heavy flowering specimen tree with an interesting trunk of fibrous grey bark. 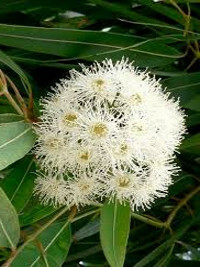 It produces profuse clusters of creamy white flowers through mid spring to early summer. It is bird attracting & bees like it as well. 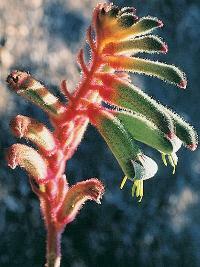 A brilliant, long-flowering Kangaroo Paw Hybrid with masses of orange/yellow flowers.Grows up to 1.5 metres high. 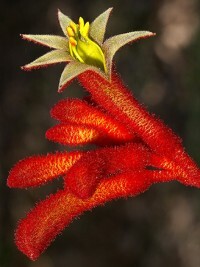 A taller growing Kangaroo Paw with large red flowers and long, dark green leaves. A strong grower that persists from year to year. Good cut flower.Attracts birds which feed from the nectar rich flowers. Best in a sunny, well-drained spot. 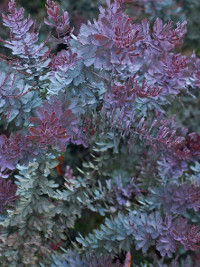 Once established, it can be cut back hard to the ground to rejuvenate, as it will regrow from the underground rhizomes. Vibrant, large, bright red/crimson flowers on stems between 0.8 and 1.2m high. 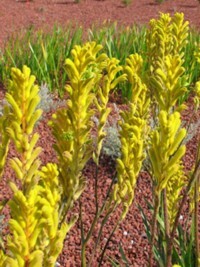 Medium sized Kangaroo Paw with foliage 0.6m high and flower heads 1.0m high.Bears masses of bright-yellow flowers throughout Spring and Summer with lighter flowerings throughout the year.A terrific splash of colour! Brilliant red stem, golden-yellow flower and perianth. Medium sized flower with stems between 0.6m and 1.0 m high. 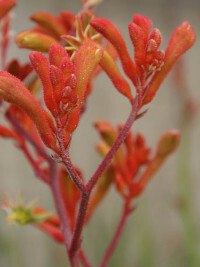 Smaller growing Kangaroo Paw with foliage to 0.4m and flower stems to 0.6m high. Masses of bright red flowers during Spring, Summer and Autumn.Beautiful, perrenial garden plant with minimal water needs. A terrific pot-plant also. Taller growing and very hardy Kangaroo Paw which performs very well in most gardens. Vibrant flower colour on highly branched stems. Prolific flowering during late spring/summer. Medium sized Kangaroo Paw with brilliant gree/black flowers on red stems. Flowers to 1metre high. Beautiful perrenial garden plant with minimal water needs. Also a terrific pot-plant too. 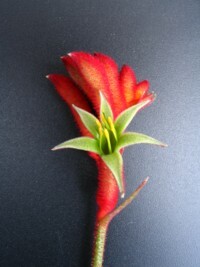 Another very showy, Kangaroo paw which has green,red and yellow flower colourings all at the same time! Flowers regularly but its main flowering occurrs from October to February.It is a hybrid, especially bred, to be resistant to high-humidity and Black-Spot problems.Flower heads to 1.2 metres tall.